Along with the Tirth and Pin Parvati treks, Raktisar is a trek that keeps you riverside up to the sources of the river. Raktisar is the source of the Sainj valley which is a larger and higher catchment basin compared to the Tirthan valley. 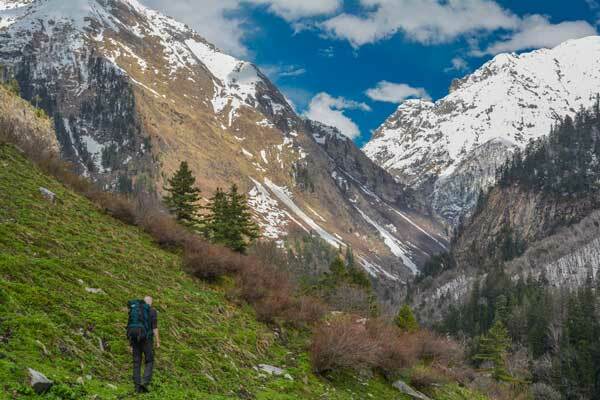 The trek is quite long, minimum 7 days in average, but it allows you to enjoy a great diversity of Himalayan Ecosystems from green lush forests of Oak trees to high altitude mountain pastures and glaciers. There are several extended or alternate routes that you could consider on this trek. The Dhel meadow is famous for its amazing scenery and the its colorful flowers. 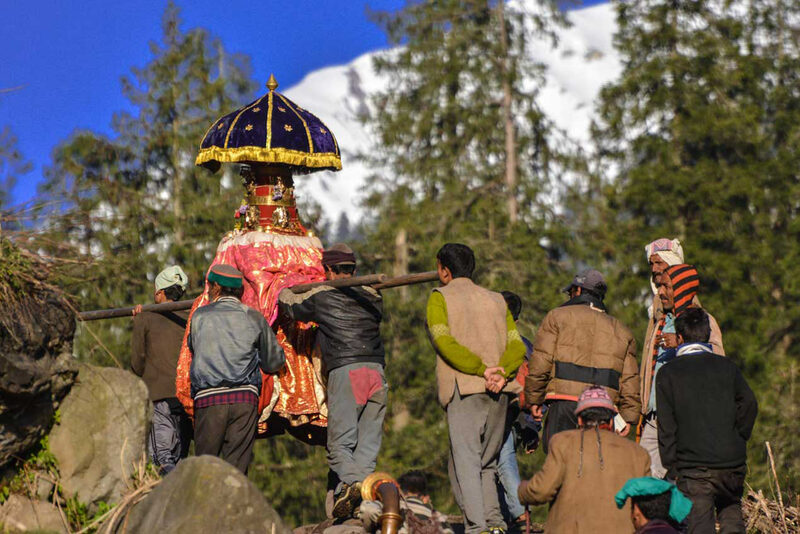 From Dhel you can even continue climbing to the pass that gives way to the Tirthan valley. A great trek ! For the most adventurer you can avoid Raktisar and continue to the Naini campsite from where you can climb the local peaks. 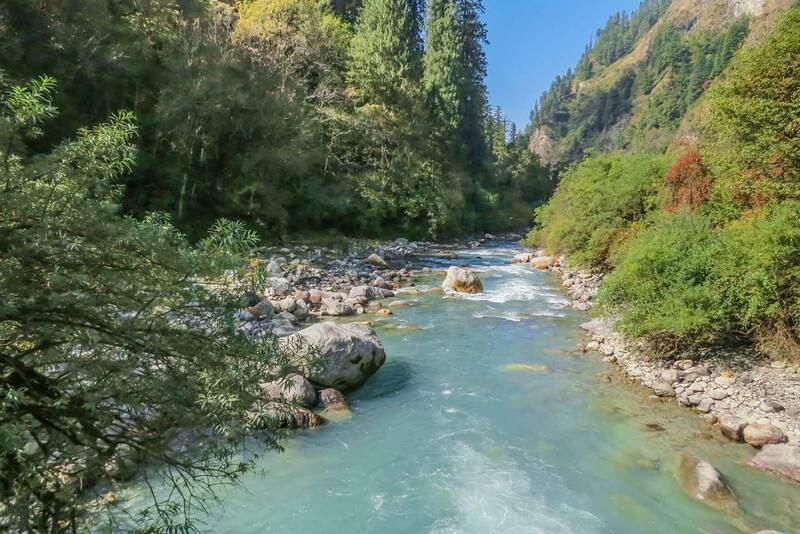 A riverside trek that takes you up to the feet of the highest peak of the Great Himalayan National Park. Best time to trek to Raktisar is from April to June and from October to November. This is the classic itinerary to Raktisar. Please enquire for the alternate routes like the Dhel meadow. The trek starts from Niharni in Sainj valley whose charm has been spoiled by an hydroelectric plant. It takes about 4 hours along the beautiful Sainj River to reach the Shakti trekker huts. It is an ideal walking day to get accustomed to the trail and the altitude. The route goes through beautiful forests with amazing biodiversity. Shakti is a small village where resides a very powerfull local god. The god has refused the shifting of both villages Shakti and Maraur at the time of creation of the Park. The tents are pitched up at the comfortable camp site. You enjoy your evening dinner under the stars and then retire for the night to your tent. On day 2 either one can hike up to Maraur or directly to Parkachi Thach. In case one camps at at Maraur for the night, the day hike can be completed at a relaxed pace. This is advised for those who are not sure about their stamina. The night at Maraur is comfortable like the previous night at Shakti. In case one decides to proceed directly to Parkachi via Maraur in one day, it will be a long day walk. One starts early in the morning after breakfast so that there will be time to halt on the way. Lunch is at Maraur. One reaches Parkachi in the evening. 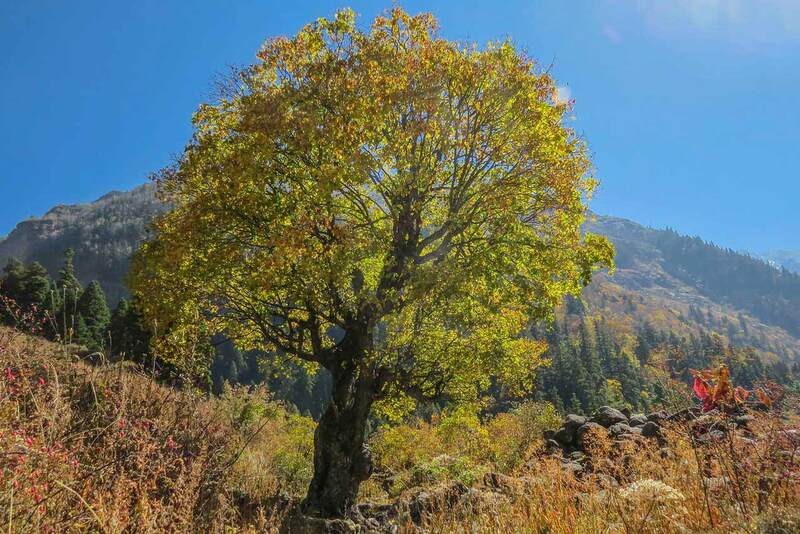 Parkachi Thach is located at an altitude where forests fade away to be replaced by beautiful grasses and flowers. Once again enjoy dinner under the stars and retire to your comfortable tent at the camp site. The forests give way to grasses as one goes above the tree-line. The trail gradually becomes rocky. The distance covered in this stage of the trek is not much but the path is steeper. There might be snow around in some months of the year. 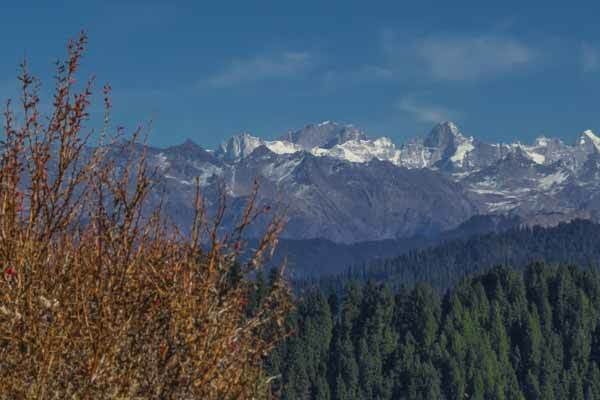 This part of GHNP is also the abode of musk deer, blue sheep, Himalayan Thar or even snow leopards around Raktisar. One arrives at Raktisar by the afternoon. Camping at Raktisar is a fabulous experience. Wear warm clothes, the weather can get cold rapidly at this altitude. No camp fire is started since there is no forest and no wood. Raktisar is at the heart of the GHNP and it is the source of the Sainj River. 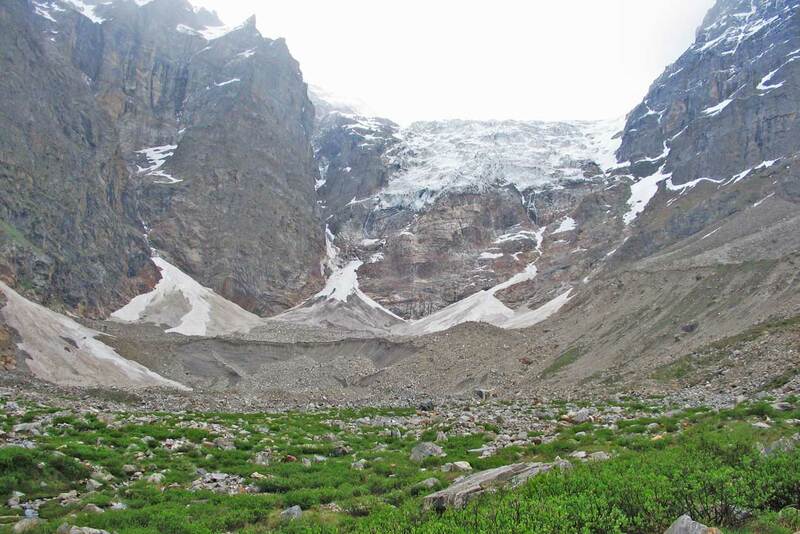 It is the meeting point of two large glaciers which have retreated because of global warming. You can see their impressive crevices in both the converging valleys. Notice also the large moraines that they have left in the valley. On a clear night, enjoy the light from the stars reflected on the glaciers. It is an unforgettable and magical experience. Spend the morning exploring the valley. There are spots high up in the valley where our guides can take you. 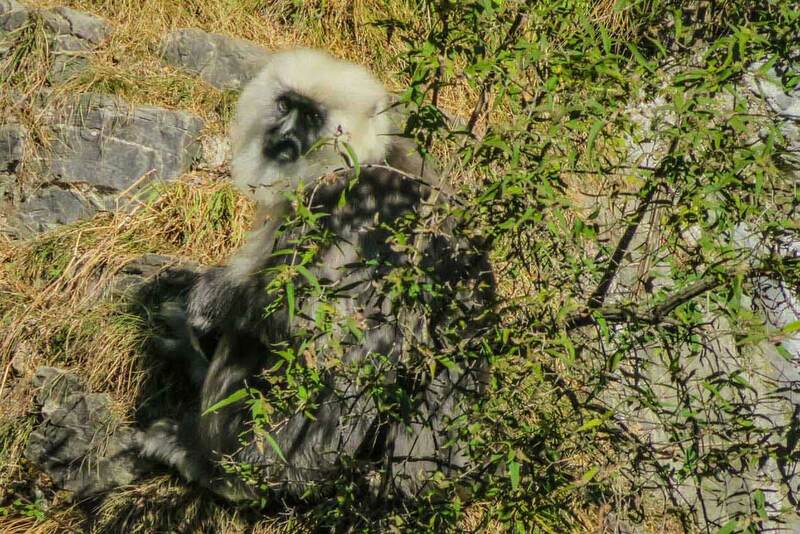 It is a excellent place to spot wildlife. After breakfast start going back to Parkachi Thach and set up your camp again. You can enjoy the rich variety of birdlife. A relaxed descent back to Niharni with a night at Shakti.